Arms: Azure a chevron between two mullets of six points in chief and a long (or Latin) cross in base all Argent. 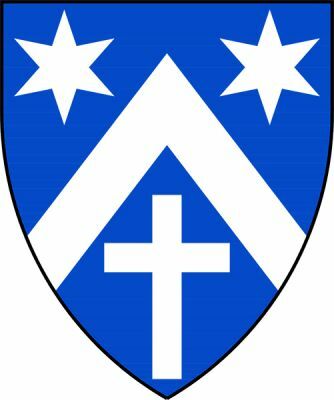 The blazon, giving us the purported arms of Bishop Challoner, is based on the arms of the school blazer patches worn by the students at the Bishop Challoner Catholic Federation of Schools as the shield is surrounded by the green hat and tassels of a Catholic Bishop. Bishop Richard Challoner was a leading Roman Catholic Bishop in England for most of the 18th century. Born in Sussex 29 Sep 1691, he was ordained in 1716, appointed titular Bishop of Doberus in 1739, consecrated in 1741 and installed as Vicar Apostolic of the London District in 1758, here he served until his death on 12 Jan 1781. Bishop Challoner is most famous for his revision of the Catholic Douay-Rheims translation of the Holy Bible completed by 1752. This revision was the mainstream bible in the Catholic English speaking world until Vatican 2 and remains so with traditional Catholics to this day.